Posh striker Conor Washington (left) in the Carton House gym with room-mate Marcus Maddison. Photo: Joe Dent/theposh.com. 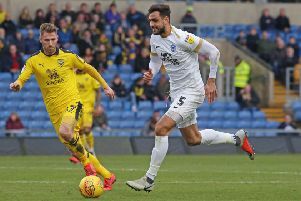 Conor Washington believes he could have his perfect strike partner in new Peterborough United signing Joe Gormley. Washington, the Posh top scorer with 13 goals last season, says he has been impressed with Gormley, a £50,000 recruit from Irish side Cliftonville. Washington said; “Joe impressed the rest of the squad from the minute he walked through the door. He has already shown in training why he has such a great goal-scoring record. “He’s a great finisher and I’ve been pleased how well we have combined in our short time together. We pretty much clicked straight away and that’s a good sign for the future. “He’s a big lad, but he looks good technically. He collects the ball on the half-turn and straight away he is looking to play me in which can only suit the way I like to play. “We’re getting to know each other quickly on and off the field and I am confident we can develop a good partnership. Washington was speaking from Posh’s luxury Irish training base, Carton House in County Kildare. The 23 year-old has been blown away by the facilities. “Going away together in pre-season is great for team bonding purposes and we have come to a fantastic place with amazing facilities. Washington is sharing a room with winger Marcus Maddison, who is apparently a big sleeper. “Marcus is always asleep which suits me as it’s a tiring week,” Washington said. Washington has yet to score in two Posh pre-season matches. Gormley scored on his debut at Dulwich Hamlet and will be keen to net again when Posh play his former club Cliftonville in Belfast tomorrow (July 8).